I was so good at accomplishing my weekend to-do list! Got both sewing-related items checked off so now I have a finished quilt top to show you, finally! Gather all your blocks together. Sew the squares into rows and then the rows to each other. This quilt is queen size and boy is it huge! I didn’t quite realize how big queen-size would be when I set out to make it. I LOVE the way it turned out…exactly how I had pictured in my head. Good news is that my sis-in-law loves it too! My only concern now is how I am going to quilt it! I wanted to do some straight line quilting, but I am not quite sure how I will fit that humongous quilt under my machine?! Guess I will just jump in, give it a whirl, and see how it goes. However, I kinda doubt I will start on the quilting this week so I won’t quite worry about it yet. My goal this week (regarding this quilt) is to get it basted and all ready for quilting- meaning it’s time to find some fabric for the backing. It was hard to take good pictures of this quilt because of its size. I needed a big ladder to stand on so I could get a straight-on shot but I only had a chair so you have to see it from a bit of an angle. Maybe I can tape it to the side of the house to get a full-on shot for later. It’s about 75/25 percent between the signed and unsigned blocks. 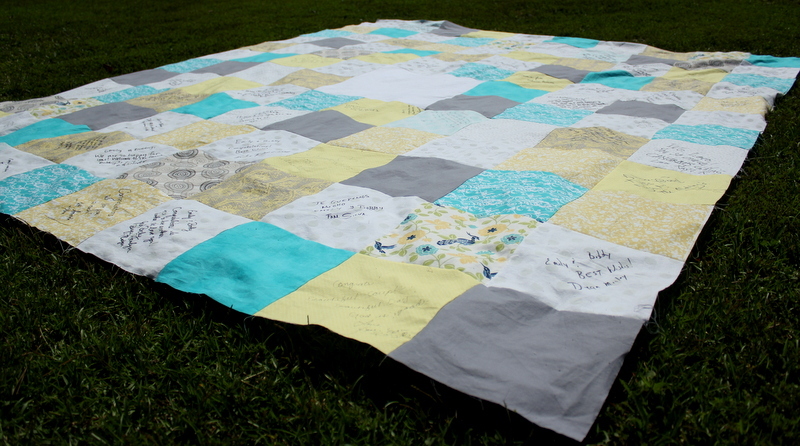 The large, white, center square will be hand-quilted with the initials of the bride and groom as well as the wedding date. Part 1 of this tutorial can be found here. 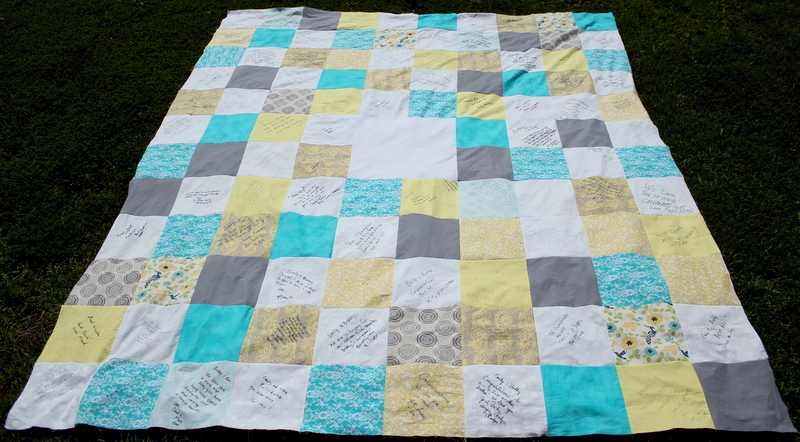 This entry was posted in Gifts, Quilts, Tutorials and tagged guestbook, patchwork quilt, wedding guestbook quilt by oliver's fancy. Bookmark the permalink. The quilt looks beautiful! You did a wonderful job! Could I ask what size the squares were and if they were pre-cut when you bought them or if you cut them yourself? Thank you for the reply! Did the bride just use regular fabric pens? 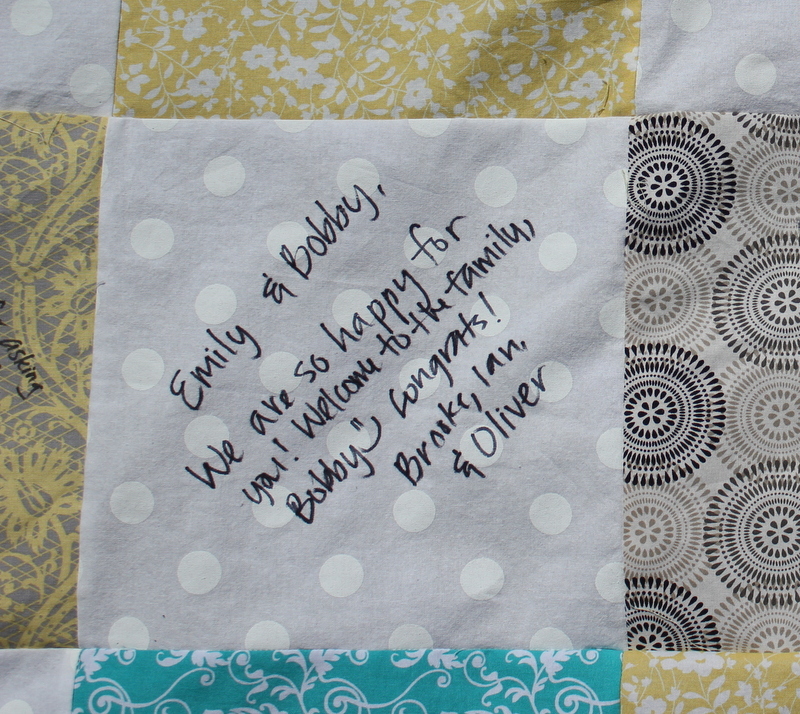 And again…great job on the quilt! I bought fabric markers but they didn’t write very well so we ended up just using sharpies. I have had some shirts with sharpie artwork drawn on them and they held up well in the wash so hoping this will too!